High on my priority list has been to get some type of swing for smarty pants to help with his sensory issues and be part of his sensory diet. We originally hung up the spandex fabric that I have for a swing in our doorway to the bathroom on our pull-up bar. It works fine for swinging front to back which is what smarty pants likes to do. Crazy boy really enjoyed spinning but that is too tight of a space and I'm scared he is going to hit the wall. My hubby and I brainstormed over what else we could do and what options we had. With hubby gone (and unable to build anything), I wanted something that was less than the $250-300 that I could spend buying something on-line that would work inside. So I figured it out when I saw this swing at our local walmart. I bought it, put it together (the pieces that I wanted) in about 30 min (with a 3 and 5 yr old "helping") and then had the boys up and swinging. 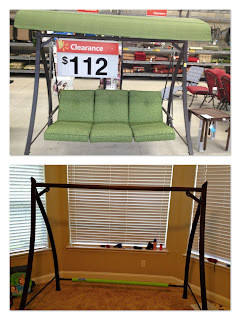 I was going to get swing that didn't have a support bar across the bottom but when I actually swang on it, I felt like this one was much sturdier and worth the potential accident seeing how I plan on supervising the swinging. I bought a pool noodle to put over the support bar that is towards the back of the swing and used all the seat cushions that came with it as "crash pads" at the bottom. I bought what I call the "pod" at IKEA a few weeks ago for less than $40. I hooked it up the boys loved it. I love this because it's inside and the weather and time of day does not interfere with us using it. I had to experiment with the height of the spandex to allow enough room for one of them to fit in it and their bottom not touch the ground but also low enough for smarty pants to be able to get in it and swing regular. The boys love taking turns and pushing it each other. We had to establish some guidelines of how "hard" to push and then when someone says "stop," that means to stop right away. Since both boys were in agreement, they were rules that were not a problem. I actually attached the large clips to the sides where holes were already made in the metal for the actual swing to go. I just tied the fabric in a giant knot and made sure it was secure. Twisting is a bit hard to do with the fabric clips that far away but can easily be done with the help of an adult. 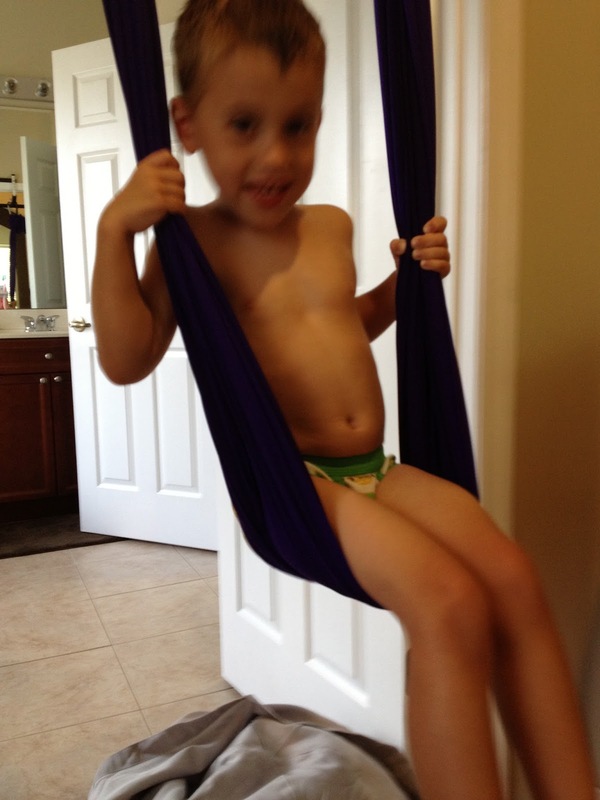 Below is smarty pants swinging by himself. As for the IKEA pod, that is working out great as well. We put a bean bag in the bottom of it (it has a separate zippered space for some type of cushioning). 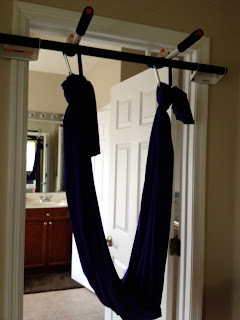 Because the swing frame is somewhat low (compared to anchoring the pod from the ceiling which is what IKEA had developed it for), I just a knot in the top of the fabric and hang it on one of the huge clips that we have. As for the pod, it is easy for them to push themselves because they can push on the pool-noodle covered bar which works out great when they want to be alone or need a time-out kind of swinging. They also really enjoyed it because it was like a mini zip line and they could slide up and down the length of the swing. I have a pair of large clips that I bought at Home Depot for 99 cents each and have now put those up on the frame when they are in the pod if I am not wanting them to be able to zip up and down. I am getting another piece of spandex material and am making a tunnel out of it. I will be also be hanging that and it will be great for them to climb through the tunnel starting at one of the swing and going to the other. 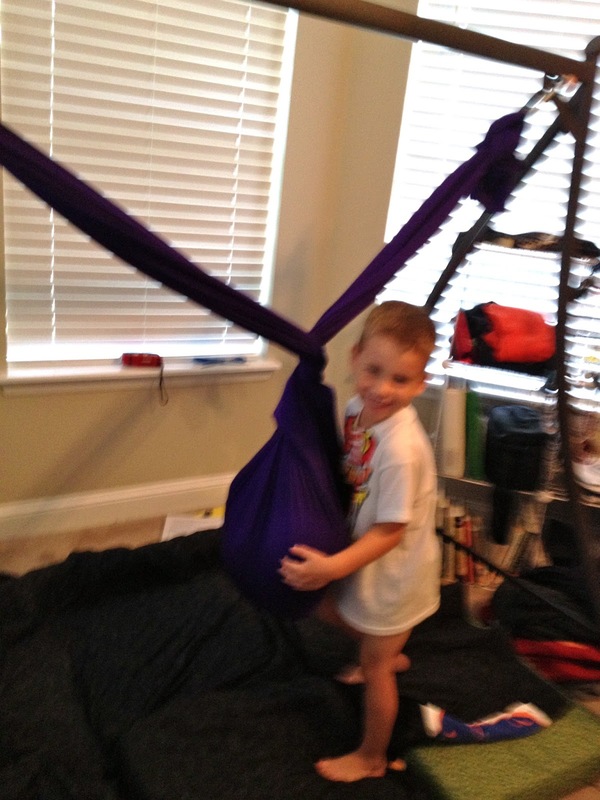 The more we play with the swing, the more things my son finds to do. He has found he likes to stand up in the pod and swing back and forth. 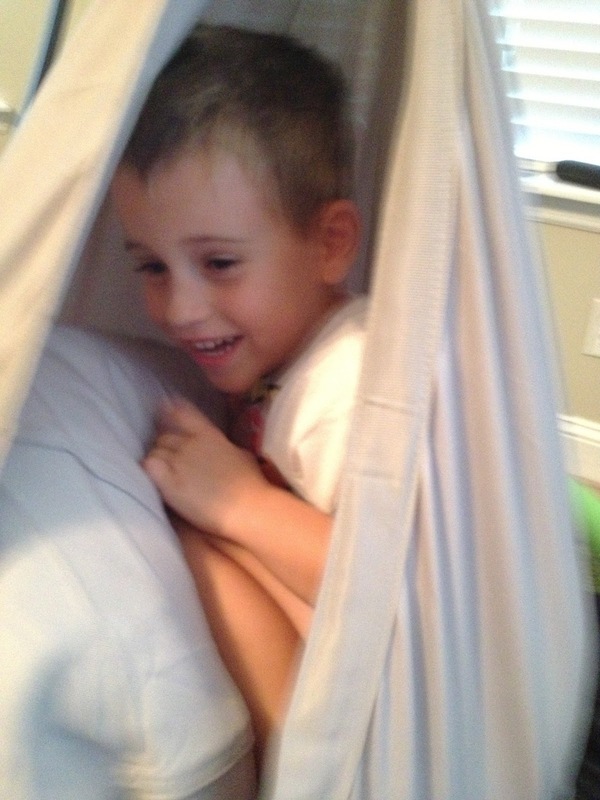 We have also now hung a rope up around the frame and he can pull himself up from the fabric. 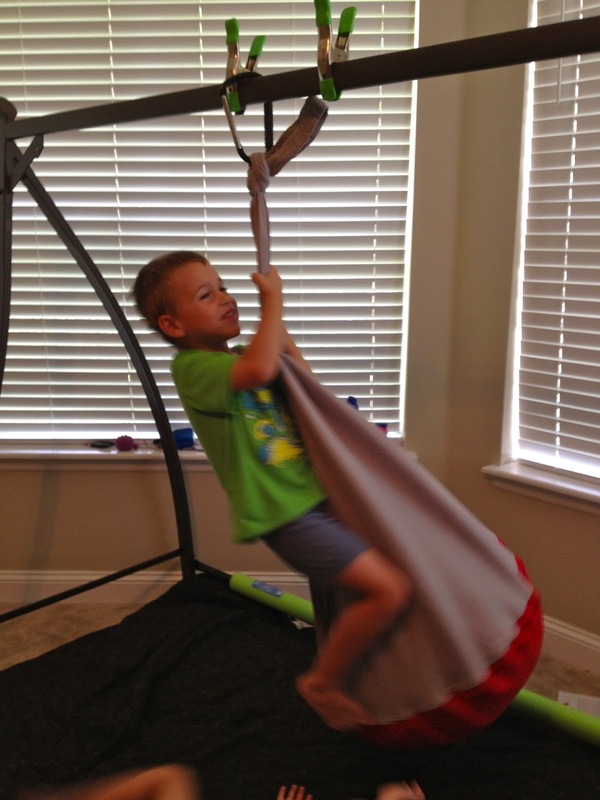 We are loving this swing and finding so many different ways to use it. I'm so thankful that I can find a way for him to get some of the sensory experiences he needs here at home. Can you shut the bathroom door with the pull up bar in place? I am trying to find the best way to have a swing in our house. His room is small. I cannot shut the door with the bar still in place but the bar is pretty easy to put up or take down.